Be careful what you ask for; you just may get it. Last fall when Bruce was here, he and I took a drive to Luxembourg. I wrote then that the drive from the northern border of Luxembourg to the city of the same name, about 50 miles, is thoroughly beautiful. Because of that, I wanted to bring Lynn back to see it but I wanted a nice day because then it would be something really special. The coming weekend was Independence Day in America but for some reason Europeans don’t take that as a special holiday. We thought this would be a good time to go as long as the weather cooperated. I asked for clear, blue sunny skies. I got what I asked for. We stayed overnight in a town, Malmedy, Belgium, about 20 miles north of the Luxembourg border. In the morning, there wasn’t a cloud in the sky and not a hint of haze in the air. This was a day made in Miata heaven. We crossed the border and it’s apparent almost immediately that it’s a different place. Things look, well, Luxembourgish. This is hard to explain. All the European countries we have visited have a different feel about them. Luxembourg seems to be more "well-maintained" than other places. The road itself goes through lots of different terrains. Sometimes it was on the crest of what seemed to be almost the highest point in the country because we had a view of the horizon that was more than 270°. Frequently the road went through thick woods and it wound around in such a way that makes a Miata driver wet his pants. This road on this day was where they should make the Miata commercials. When Bruce and I were there before, we somehow lost our way. I remembered that clearly but couldn’t see on the map how it happened so I knew to be very careful around the town of Wiltz. We got lost again. It turns out that the road, while clear on the map, is discontinuous in reality. I suppose if you’re a local you know that. After we passed Wiltz, we knew something was wrong so we thought we’d pull over at the first available place to look at the map. 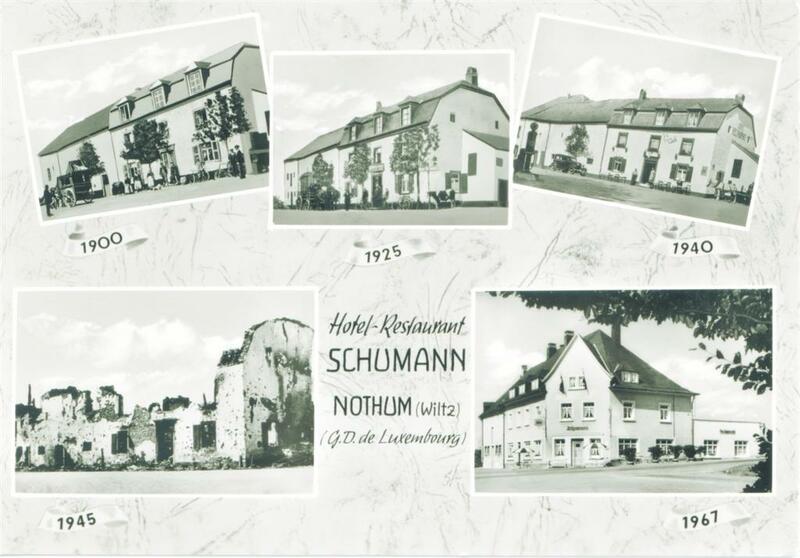 The first place was a beautiful country inn called Hotel Restaurant Schumann. It was lunchtime so this was convenient. The inn was at a crossroads of two country roads (neither of which we intended to be on) and had a great view of the forest on one side and the valley on the other. The waitress spoke little English but gave some decent directions to get back to where we wanted to go. She must have told the owner about our question because he came by and in better English explained the way. Upon leaving they gave us a postcard of the place, showing the way it looked over the years. Everywhere one goes in Europe, if one pays attention, there is evidence of bad things having happened. Look at the picture from 1945. The place was totally destroyed. 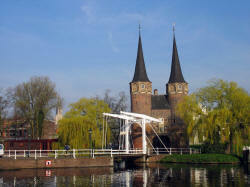 It was rebuilt and this is how it looks now, similar to the 1967 picture. Our drive took us past the side of a hill, about 300 feet high overlooking a dammed lake, an idyllic sight. The descent was so steep and quick that in less that a mile we drove across the dam. The drop on the other side of the dam, not visible from above, was about another 200 feet. Malmedy itself is a really pretty town. There’s a central square, triangle really, filled with restaurants of many varieties. Down the street there’s an ornate old city hall (Hotel deVille – they speak French in this part of Belgium) and across from that a large old cathedral. Evidence of bad things having happened is here, too, which is not surprising because this town is so close to the German border. Next to the cathedral is a memorial to about a hundred civilians whose deaths were caused by some Nazi action in World War II. Just behind that is a cliff in which are two bunkers, one low which is blocked so it’s not accessible, the other high and inaccessible on its own. On the way home we stopped in Waterloo, where Napoleon met his, and saw the monument on the battlefield to the Battle of Waterloo. It’s said that we only remember the winners of things but this place is the exception. Napoleon was the big loser here but there are all kinds of memorabilia with his name and likeness on them. The memorial is a gigunda mountain built in a circle going up 226 steps (no research on this one, I counted) at a 30° angle to almost a point at the top. At the top is a humungus statue of a lion. The monument was built by King William I of the Netherlands on the spot where it was believed that his son, the Prince of Orange, was wounded. I sang along, quietly, with the troubadour. "Take me home to the place I belong." It’s Independence Day in America and America is where I belong. Make no mistake, we love Delft and we’re not ready to return, but home is where your heart is and our hearts are in America, specifically, the Cradle of Liberty and the Birthplace of the Nation. We hope you all had a great July 4th and remember, we don’t know just when, but we’ll be back. See all my pictures of Luxembourg, Malmedy and Waterloo. See my videos from Luxembourg and Waterloo.